Maybe it is time to invest in a unique and individual greeting card to send out on behalf of your business. Or perhaps you would like to experience the joy of having customized holiday greeting cards to send to family and friends. 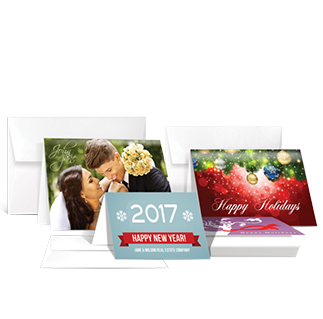 Avanti Printing offers high quality, customized greeting card printing services to fit the needs of every individual and business owner. Greeting cards can be used for a wide range of special occasions. Companies of all sizes use greeting cards printing for all major holidays, birthdays, thank you cards and many other occasions. Using greeting cards is an excellent way to stay in touch with your customers and, keep your business in their minds. A custom card generates positive feelings about your business, which enhances your relationship with your customers. Our customizable greeting cards will exceed your expectations in terms of quality and design. These full color greeting cards not only allow you to develop your own individual text, but offer a wide variety of colors and designs. We offer nearly limitless options in pre-designed and custom greeting cards printing. Select a design that has a theme that conveys the message you want to send. Generating new business is only part of your overall marketing strategy. Customer retention is an important goal for any business. Custom greeting card printing helps with this. Don’t spend another holiday season sending out the same old boring greeting cards. Instead, try our personalized greeting card services to really capture the spirit of the holidays – as well as the attention of your clients. Your investment will build a relationship with your customers and they are more likely to return to your business. Contact us in our Irvine office in Orange County, California or request a quote on our website. Request A Quote For Greeting Cards Today!